Because there were only three of us running some of the harder stuff it was hard to capture video (as we were on saftey duty), but we did get some shots. As the Kayak Session guys say in their video; there were some good lines and some not so good lines. I’ve pinched that line for my video. Enjoy. The last day of our holiday arrived and there was one river section Andy wanted to get under his belt on the recommendation of the KS boys- the lower, lower Golo. Andy and Stu blasted 7 km of III to IV river in about 45 minutes while Jules and I went and prepared lunch at the get out. Back in the van and over to l’Ile Rousse to catch the ferry back the mainland and the long trip home. Below are a few shots of the island on our drive to the Ferry Port. Photo: Andy and Jules and the Escape-to-Adventure-Mobile. Photo: Corsican sea kayaking is supposed to be spectacular; i can understand why. Photo: Life-ring with Corsica in the background. What a great time; I’m booking my place for next year. Wanna come? Corsica- Day 5; the TRAVO!!! Friday (and Monday) in Corsica is TRAVO DAY!!!! Limiting kayaker river access to just two days a week keeps the local fishermen happy. 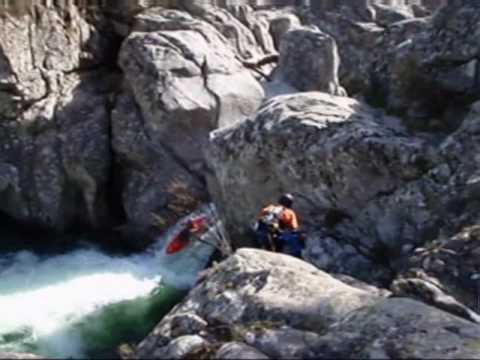 The Travo is probably the most famous river in Corsica (and certainly the most photographed) . We planned on running two sections of river this day, so three of us headed down the river forthe best run of the week. The Travo has big, long, steep boulder gardens. It’s has fun sneak routes that are more appealing than the alternative class V rapid. Photo: Part 1 of a 2 part class 5. Portaging or inspecting would not be fun in the rain as its hard to stick to the rock. And finally it has the teacup drops, for which it is famed. Photo: a paddler on the first, 15 ft slide of the three teacup slides. In short, it has everything a class IV / V boater could wish for. I think thats ’nuff said . The run is 7 km and we hiked off at the only mid-way access point; just above the 3 classic teacup drops. There was no way to run the teacups without committing to the lower 3 km and hiking off was the only way we could achieve 2 runs in the day. It just means that I have unfinished business on the Travo and I have to return to finish the job . After the Travo, Stuart and Jules re-visited the Tavignanu and blasted it in record time. On wednesday night Andy and I headed to the Kayak Session Campsite on the banks of the Tavignanu and had a chat with the guys from Kayak Session. KS had posted a giant map of Corsica indicating medium (grade 3-4), hard (grade 4-5) and extreme (5 to 5+) runs; it was super handy. Andy and I were thinking it might be nice to run the middle and lower Fium Orbrrrrrrrro (to be said inthe style of the video guide), classified as “hard” but the guys suggested that we go and do a section of the upper Golo instead. Photo: A line of catepillars on a rock at the get in. I’m so glad we listened to their wise words. KS suggested running just a 3 km stretch of this river, thereby avoiding some manky rapids up stream. We put in at a foot path on the river right side just before a series of fun drops. The river was again pool drop in nature and the first double drop looked a bit inoccuous. But by then we’d realised that in Corsica things can get sticky no mater how gentle they look. Stu and I set saftey for Andy as hed led. Andy ran the drop closely followed by me then Stu and Jules portaged this one. The river is just a series of ledgedrops and slides and all I can remember is that it was immense fun and I was smiling and giggling all the way down. We ran into the Kayak Session boys leading a gourp down- I’ think KS were doing daily guided tours based out of the KS campsite. Photo: The Kayak Session Boys leading a group down. There were ace boof spots followed by tight technical rapids, all mainly Class IV. Photo: Andy boofing a ledge drop. Somes holes were very stick and as Stu founds out, some were quite boxed in. The only way out of this one was live bait or a swim- and as a reward for the swim was the hole eating stuarts split paddles for dinner. If anyone finds them, can you return to Andy Holt at escape to adventure? Photo: Stu getting punished for going too far right. Photo: Andy dropping into a small gorgey bit after a drop, typical of the upper Golo. Photo: Some German paddlers filming some great lines. As we were staying in Aleria and it was practically on our doorstep, we scouted the Fium Orbo after the Lower Vecchio. After seeing the goodies it had to offer it was a no brainer that we would do it the next day. We arranged to meet some Czech guys at 10: 30 am, who knew where the put in was. From the video it looked like the put in was just upstream of the rapid know as the rocket. However we followed the guys many more km upstream to a place that was called Cavi (if i recall right).We then turned left and down a dirt track and it was about a 0.5 km hike to the get in. At the get in we bumped into fellow brits Mike Moxon and Ted Piper. I’d met Ted as Hurley a few weeks before and it was nice to see a familiar face in the Corsican waters. Our Czech friends offered to share some home made plum schnapps with us, but for me, 10:30 am was a tad early for such a strong smelling liquor; it woke me up mind… We put on and shortly after we had a small pin incident and one of our party hiked off, deciding not to run the river. Stuart, myself and Andy carried on and found it to be a delightful river with some boof and flare spots and some lovely boulder gardens. We portaged one spot that looked a bit pinny, but we ran everything else until the bridge marking the Class V+ rapid came into view. There was a siphon just before the portage on river right but was easily avoided. We had asked Jules to take pictures of us on the Rocket and he graciously agreed and when we saw him high on the bank, we signaled what we were doing. Now the rocket is an interesting rapid. The put in after the portage is on the river right side on ledge about 3 m up. Stu and I set safetyon the river left side, using my hex nut that Leo suggested taking to Corsica (as no trees at river level). Andy went first. We had agreed to use whistles to indicate leaving the eddy and running the drop. He made it safely down then Stu went and finallymyself. Stu had a great slide down the seal launch. Its hard to see from the photos, but the drop is higher than it looks and there is a narrow section before opening out at the bottom. Photo by Jules: Me on the Rocket. My paddle found my teeth at the narrow section, but my paddle must have been vertical because it hurt my top teeth and bruised my chin in a perfect line…My teeth are still fully functional and I won’t be gurning any time soon and I’m still counting those lucky stars…and glad im not seeing them instead. A fantastical day on the river and I cant wait to go back and run the section of river below the rocket. Then it was back to gite for barbecued goat and other tasties. We decided to get 2 easier river sections under our belt on day 2 as another warm up for running the harder sections later in the week. Our rivers of choice were the lower Golo- described as fun with a capital “F” on the video guide (can confirm this holds true!) and the lower vecchio. Photo: Looking upstream at the get in for the upper Golo. We took turns in leading and seconding on the lower Golo. There was only one rapid worth inspecting at the levels we ran. We sent Stuart down as a “probe” and he got stuck in the hole for a second or two before escaping and hoping out of his boat to give us a signal. The German group who were just ahead of us portaged, as did one of our group. Andy and I ran next while Jules ran safety. Plenty of opportunity to practice boofs and flares on this run before hitting the bigger stuff later in the week. Pour-overs were sticky however, so it was best to always stick your lines. Photo: Andy and our new German friends on the Lower Golo. Take out was at the bridge and just enough time to hit the supermarche in Corte for lunch before heading for a late run on the lower Vecchio. The lower Vecchio is probably the best warm up run we did. It’s style is class 3 technical boulder garden and a good example of what you can find on the harder runs (e.g. Travo). There was some pin potential on this section and you may not have line of sight with everyone in your group, but you can always maintain it with the guy in front. The section is very pleasant and I don’t remember any significant rapids on it. If things go well on the Golo you could combine it with a 3 km stretch of the upper Golo rather than the Vecchio. Photo: My dream house a the get in for the lower Golo. After a good nights sleep and late start, we talked about what run to do, given that I hadn’t paddled with the boys before. We wanted to do something that allowed all of us to assess each others skill level. We reviewed the Kayak Session video guide and decided on paddling the Tavignanu. Acclimatising easily to the 20 degree C weather and debating cag or drysuit, we left Aleria headed to the get in for the upper Tavignanu. As we were having the debate I thought for a moment about my regular paddling buddies who were up in Scotland paddling in the cold and wet and felt a slight sense of relief that I’d opted for warmer climes. We decided not to go too far upstream on the upper section as it was supposed be Class 2-3, whereas the gorge, downstream was 3 to 4- (gauge,river left at take out was 1.6 m). As we pulled into the layby to put in, a van pulled up and it was a German TV crew. They asked us to hop in the van and up to the Vecchio to be filmed for TV. Although we all wanted to rise to kayak superstardom through being on German national TV, we did the sensible thing and declined because we were unsure of each others skill level. The upper section was a nice bouncy ride with few skiffle and small rapids until we hit the Kayak Session Campsite where the river turned into a lake. After about 1 km of flat water paddling we hit the hydro dam and we looked at running the fish ladder on the river right (not so nice) and opted for the portage river left. Photo by Jules H: hydro on the Tavignanu, the runnable fish ladder clearly shown on river right. The dam marks the start of the Gorge section. A great little warm up place to check every one’s skill level and shakedown for gear. I was paddling my Nomad 8.5 for the first time and was hoping that everything would be okay with it (which it was). I loved its performance and responsiveness as soon as i put the first duffeck in. Its fast and generally a lush boat. The gorge is just spectacular; large cathedrals, tight gorges and lovely rapids. The water, was class 3 but with tiny a bit of 3+ in there (due to undercuts). Nothing of consequence on the there as far as I could tell; pool drop in nature. Take ot was at the second bridge on river right side, just after the gauge. Scramble up the path. Photo: Stuart and Jules in a gorged in bit. This is a nice river to warm up on and figure out peoples ability if you’ve never paddled with them. I would recommend combining it with the lower Vecchio (see day 2 post). I’ve recently returned from a whirlwind trip to the wonderful Mediterranean island of Corsica. I’ve been wanting to paddle these sacred kayak lands for some time. As a kid, I paddled a Corsica “S” for many years and I thought it would be fitting to paddle the rivers on the island of my boats namesake. So when I saw a post on UKRGB from Andy Holt from Escape to Adventure saying that he and two mates were heading over for easter and that he had a spare space in his van, I declared “shotgun” and headed out there with them. Having never paddled with any of the guys going before I was a little apprehensive. But I figured that Andy’s reputation, being a very good one, I would be in fine company with him and his mates on the river. Stuart, Andy and Jules handled all the logistical planning for the trip and did an excellent job.With an overnight ferry from Dover to Calais, Andy and Stuart shared the driving overnight and throughout the day to Nice. At Nice we saw a welcome sight- our ferry to Corsica. As we neared Corsica, the rain began to lessen and the sun began to set. As we looked out of the window, we could see this mass of land rising from the sea, that would be our adventure playground for the next week. It was one of those….ahhhhhhh….moments. Photo by Jules: Sun setting behind Corsica. We opted for a gite in Aleria, on the east of the island. After the 5 hour crossing it was another few hours drive to our accommodation. We arrived, after the 26 hour trip, ready for bed, but super-excited to get on the water the next day.